"Policemen asking questions are being policemen, but little old ladies asking questions are just being little old ladies." There's a subgenre of Mystery Fiction called "Cozy Mysteries", a prevalent trope of which is the little old lady investigator. She is an older lady, usually retired, usually a Cool Old Lady, who has a knack for solving mysteries and who is always solving murders wherever she goes. She's usually an Amateur Sleuth, but occasionally she works for an agency or is a registered PI. The fact that people seem to keep dropping dead around her often makes her a Mystery Magnet. This sub-genre is also known as the "tea cozy mystery". More realistic takes on the concept have her solving minor misdemeanors and crimes which the police are too busy to solve. The most famous Little Old Lady Investigates character, and the Trope Codifier, is probably Agatha Christie's Miss Marple. Where family is present, she's usually why you should Never Mess with Granny. Compare Kid Detective, which could be considered the other extreme of this trope (but unlike it, is not Always Female). Agatha Christie's Great Detectives Poirot and Marple has Miss Marple as one of the two eponymous Great Detectives. Yattokame Tanteidan, a 2007 kids anime series about a young girl who solves mysteries with the help of her candy store owning grandmother and her grandmother's friends. As Japan has different social taboos on what kids' anime can contain, there are murders in this series. Detective Conan has one episode where Kogoro is invited to a gathering of other famous detectives in the adult category as opposed to Shinichi's teen detective peers. Numbered among them is a little old lady detective who seems to have worked frequently with the two-fisted man of action private detective perhaps because their opposite strengths combine effectively. This ends up becoming a Subverted Trope since the little old lady uses her status as being Beneath Suspicion to murder her partner, and plans to do the same to everyone else. Part of Saki's backstory in Hayate the Combat Butler is that her grandmother is the "legendary housemaid" Kijima Rei, who, among other things, has been known to solve mysteries and prevent assassinations. An episode of the 1998 anime series Master Keaton, "A Case for Ladies", has the titular hero team up with an elderly English woman to solve a murder. The elderly woman displays quite a bit of genre savviness, as she unfavorably compares Keaton to Humphrey Bogart and Steve McQueen. Madam Fatale is an old woman who fights crime and solves mysteries...sort of. Fatale is actually a man who took up the Madam Fatale disguise in order to find his long-lost daughter. Why he kept the disguise after he confirmed that his daughter was gone, we're not sure. Finnish Donald Duck comic artist Kari Korhonen has put Grandma Duck in this role. Prudence Petitpas was created by Maurice Maréchal in 1957 and got recently her own animated show. The mystery movie spoof Murder by Death has many parodies of famous fictional sleuths. Miss Marple is parodied with Miss Jessica Marbles. In a subversion, Miss Marbles isn't the wheelchair-bound old lady who first appears with a triumphant fanfare, but the merely middle-aged ladynote Surprisingly, Elsa Lanchester was about 74 when this movie came out. pushing the wheelchair. The old lady is her former nurse. Happens in the Korean film Madeo (Mother) about an elderly woman trying to clear her son of a murder charge. Agatha Christie's Miss Marple is the Trope Codifier. In one book she explains her success like this: "Policemen asking questions are being policemen, but little old ladies asking questions are just being little old ladies." Dame Agatha's Tuppence Beresford of the Tommy and Tuppence books uses many aspects of the Little Old Lady Investigates (in the later books - the Beresfords age in real time), but isn't a pure version because she prefers to work on instinct, has a partner in her husband Tommy, and often works under the auspices of an official branch of the government. In N or M?, though, she essentially plays this straight while undercover as a doddering housewife and acting essentially as an independent agent. Even before Christie, American writer Mary Roberts Rinehart (who's also believed to have coined the phrase "The butler did it") was pioneering this genre with such novels as The Circular Staircase (1908). Dorothy Gilman's Mrs. Pollifax is a little old lady investigative CIA agent. It's a bit more believable when you learn that she was originally hired by the CIA as a decoy courier by accident when her file was inadvertently placed in the "people we can use for this decoy run" stack instead of the "people we've reviewed and rejected" stack, but her Nosy Neighbor and Weirdness Magnet tendencies, combined with a very no-nonsense common-sense approach to whatever trouble she landed in, led her into more and more active assignments — this while still being essentially a part-timer who works for the CIA to keep her retirement years from being boring. There's been two movies made featuring Mrs. Pollifax, the second was a made-for-TV movie in 1999 starring... you guessed it... Angela Lansbury. Mrs. Pollifax isn't quite the normal little old lady either, as witnessed by the not more closely described "karate chop", which she delivers to many a foe, who is invariably rendered unconscious. Dorothy Gilman also wrote a novel entitled The Clairvoyant Countess. The title character, Madame Marina Karitska is Russian and uh, clairvoyant. Her talent leads her into many investigations with a member of the police department Detective Lieutenant Pruden. Gladys Mitchell's Mrs. Bradley (later Dame Beatrice Bradley). Justified Trope in that she was a psychoanalyst and had legitimate Home Office recognition. Dave Stone parodied this trope in his 1997 Bernice Summerfield novel Ship of Fools with the character of Agatha Magpole. The inexplicably high rate of murders that occur when this little old lady is around turn out to be caused by her extremely powerful, yet subconscious, psychic abilities, which drive people to homicide. Stuart Palmer's Hildegarde Withers, who also appeared in several movies in the 1930s, although it's notable that in most of the books she's only "old" by the standards of an unmarried woman of the time. She was aged up for the movies. Miss Climpson, the chatty, knitting, deeply religious old lady who works for Lord Peter Wimsey, gathering information in places he can't go without arousing suspicion!! And yes, THIS is how the character talks and writes! Terry Pratchett's Maskerade mixes this and Phantom of the Opera, parodying the heck out of both along the way. Nanny Ogg does this in most of the Witch books; her ability to get along with people means she's usually the one with the most information. Deconstructed in the C.J. Henderson short story "Granny Gumption Solves a Murder" from 100 Dastardly Little Detective Stories. The titular Granny Gumption does indeed solve a murder, and confronts the murderer in his own home, without any witnesses— and mentions that she didn't tell anyone else that she figured out the truth. Needless to say, she becomes his next murder victim in an excruciating death scene that starts with a broken jaw and Eye Scream and just gets worse from there. The No. 1 Ladies' Detective Agency: Precious Ramotswe falls squarely into this category, despite the fact that she rarely solves murders, isn't all that old and is hardly little in the waist department. The same goes for another of Alexander McCall Smith's heroines, Isabel Dalhousie of The Sunday Philosophy Club. Isabel is only in her forties, though, but is definitely nosy enough. One review has even described it in terms of tea and coziness. The Miss Seeton series written by Hamilton Crane and Heron Carvic and I think one other H.C. She is a retired art teacher and has an knack of drawing cartoons that see beneath the surface of character or event. She is usually completely unaware of what she has done to solve a case. Patricia Wentworth wrote 32 novels featuring retired governess turned private investigator Miss Maud Silver. Marion Mainwaring wrote a comic novel called Murder in Pastiche: or Nine Detectives All at Sea featuring pastiches of famous detectives. Miss Fan Sliver was an Expy of Miss Silver (with touches of Miss Marple) representing the whole school of Little Old Lady Investigates mysteries. Simon Brett's Mrs. Pargeter is indeed a little old lady. On the other hand, she's the widow of a professional career criminal, and so has access to inside knowledge & contacts, which isn't so little-old-lady-like. Parnell Hall's Puzzle Lady series involving a middle-aged "constructor of puzzles," Cora Felton, and her immediate relations. The series is played up more like a sharp and biting satirical sitcom, even after the bodies start showing up, however, (she is a master of snark, even when pushing and prodding bodies) so it's more of a perfect genre marriage than leaning one way over the other or being an overbearing parody of one or the other. The scenes where she confronts the bad guys or delivers evidence are straight out of the most comical courtroom scenes imaginable with the dialogue of a Pratchett novel, such as Liar Liar, Legally Blonde, the infamous Stooges' short, or the Stacy Keach portions of And Justice For All. Nancy Atherton's Aunt Dimity has its own twist: Dimity is dead. She communicates with Lori, the daughter of her oldest friend, by way of a magical journal. Lori and her husband Bill (a attorney specializing in estate planning) are among those who do the legwork in the material realm. Mademoiselle de Scudéri, the heroine of E. T. A. Hoffmann's eponymous novella, is a poetess in her seventies at the court of King Louis XIV of France, when she gets roped into the hunt for a serial killer who murders wealthy lovers on their way to their mistresses with expensive jewelery. Parodied in the German pulp series Butler Parker, where Lady Agatha Simpson fancies herself a (rather loud and energetic) example of this...but as the title already gives away, it's her faithful butler who together with a few steady friends actually solves all the cases while she's very much The Ditz. Second Chance Cat Mysteries (a Cozy Mystery series by Sophie Ryan): While main protagonist Sarah Grayson (owner of a secondhand/"repurpose" shop in Maine) is relatively young, her employees include the elderly trio of Liz, Charlotte and Rose. When a friend of theirs is accused of murder, the women and their friend Alfred "Mr. P." Peterson set up shop as detectives in order to clear her name, dubbing themselves "Charlotte's Angels" (with Mr. P. as their Bosley), and are surprisingly good at it. Neither Sarah (who tries to keep out of their detecting but winds up their "Charlie") or Charlotte's son Nick are exactly thrilled by this (in fact, Nick continually tells them to stay out of police business and asks Sarah to help shut them down), but the trio and Mr. P. just ignore anyone who tells them to stop. By the events of book 3, Nick's given up on trying, especially after he finds out Mr. P. has officially and legally become a registered private investigator. 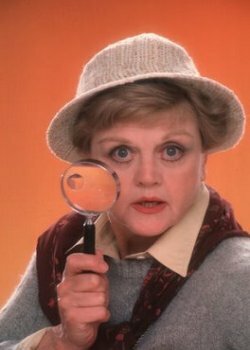 If Agatha Christie's Miss Marple is the most famous example of this trope, Jessica Fletcher (Angela Lansbury) in Murder, She Wrote is arguably the second most famous, as well as the most famous TV variation. In the Columbo episode "Murder by the Book," Jack Cassidy and Martin Milner portray the co-authors of the Mrs. Melville mysteries. Columbo creators Levinson and Link would later create Jessica Fletcher. Hetty Wainthropp (Patricia "Hyacinth Bucket" Routledge) in Hetty Wainthropp Investigates is one of the more realistic takes on the trope, because she's a registered PI that by and large solves minor crimes and misdemeanors that the police can't be bothered with. She downright refuses to take murder cases. Sometimes she is hired to investigate larger crimes with a clear bias, such as when a young girl keeps turning up at the scenes of arsons and her mother hires Hetty to find another suspect. One of the few exceptions to the Always Female nature of the trope, Tom Bosley's turn as Frank Dowling in Father Dowling Mysteries works on the same principle as other examples. Nobody's going to go against a unassuming older Catholic priest are they? Hayes and Natwick, along with Myrna Loy and Sylvia Sidney, had earlier played this character type in a made-for-TV movie, Do Not Fold, Spindle or Mutilate. In the BBC children's series Marlene Marlowe Investigates, Marlene was assisted by her interfering Aunt Maud. Rosemary & Thyme, though they are more middle-aged than elderly. One of them, Laura Thyme (played by Pam "the Trunchbull" "Sister Evangelina" Ferris) is an ex-cop; the other, Rosemary Boxer (played, perhaps fittingly, by Felicity "Barbara Good" Kendal), is an ex-biology professor. The Mrs Hawking play series: Played With in that primary investigator Mrs. Hawking is forty years old and a widow when the story begins, considered outwardly by her Victorian society to be something of a strange old lady. But she is dangerous and physically honed, as much a warrior as she is a detective. Charlotte Dickens-Johnson, one of the playable characters from Guilty Party. She's a crime-solving maverick, a serious kung-fu threat, and one half of a crazy Battle Couple with her husband Butch. Granny (from Looney Tunes) in The Sylvester and Tweety Mysteries; as this is a kids show, she doesn't solve murders, but gets caught up in terrorist plots or huge international jewel heists instead. Wheel Squad: Elderly actress Rosaly did this in one episode. In Pound Puppies, McLeash's favorite show features a character. April O'Neil's aunt in Teenage Mutant Ninja Turtles (1987). The investigation of the triple murder of the Rogers women in 1989 in Tampa, Florida, had been about to be shut down before Jo Ann Steffey, a resident of Tampa, saw that her neighbor's appearance and handwriting matched that displayed on billboards asking for help in finding the killer and reported her suspicions to the police. Her neighbor, Oba Chandler, was arrested, tried and convicted for the murders in 1994 and executed in 2011. Netflix Original Series The Keepers is about a pair of older women trying to solve the murder of their teacher, Sister Cathy Chesnik. Frances Glessner Lee, who established the Harvard Department of Legal Medicine and the Harvard Associates in Police Science and is considered "the mother of forensic science", hosted seminars for homicide investigation, made the intricately detailed "Nutshell Studies Of Unexplained Death" dioramas, and was named an honorary captain (the first female police captain in the United States) in 1943. All while she was in her 50s and 60s.